Today I have another floral design to share with all of you. These are some of my favorite manis to do! I incorporated some of my favorite polishes and designs into this one. I have been really missing doing my simple geometric designs lately, and since you all loved my Rose Gold X Nails so much, I figured I would try another rose gold pattern. I actually pulled some inspiration for this from my Purple and Gold Floral Nails from a few years ago, where I did a white and purple floral nail and had the leaves in a metallic gold. I have always loved that design and I was hoping to re-vamp it into this color scheme and add a little bit more of a geometric accent to it using some nail vinyls. 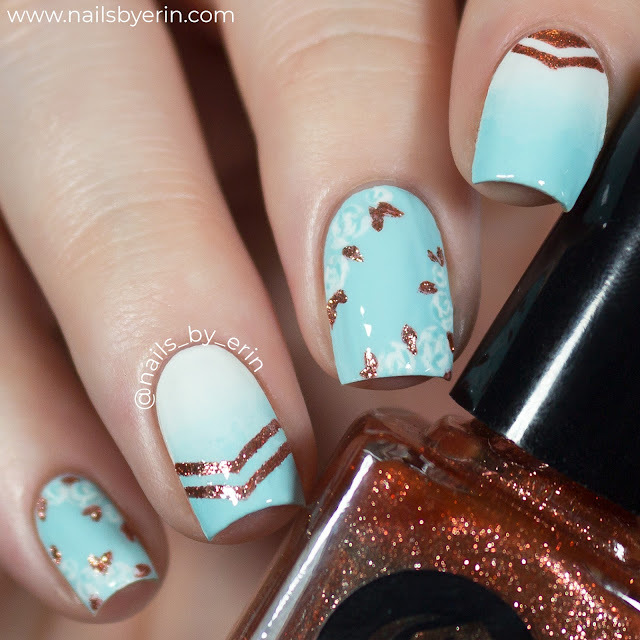 I used Essie "Mint Candy Apple" as the mint shade in this mani, and the beautiful rose gold glitter polish is "Halcyon" by Cirque Colors. I have been really loving these shades lately and I though they would look beautiful together. 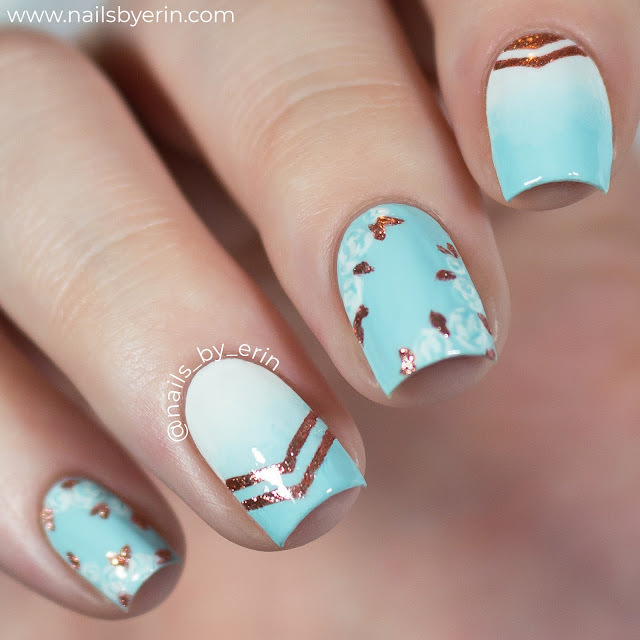 To create the V shaped rose gold lines on my index and ring finger nails, I used vinyls from Snail Vinyls. Unfortunately, Snail Vinyls is closing shop and having a "goodbye" sale, but you can find a lot of my favorite vinyls over on their site for a great price! Be sure to check them out while you can. Overall, I actually like how this design came out, but I am not super happy with how the photos turned out.... I feel like they really don't do this design justice! The floral pattern keeps getting lost since the mint color is so faint. I tried darkening that part a little bit but it still doesn't look exactly how I want. Maybe I'll try this again with a darker shade of minty blue!